Didactic portions of this program are held at the National Career College additional classroom location (14547 Titus St., Suite 102, Panorama City, CA 91402). 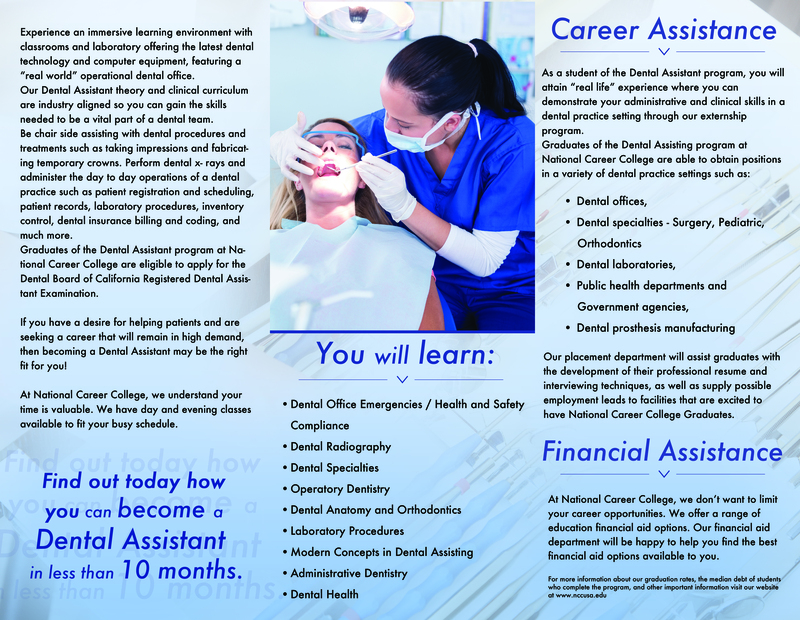 Find out today how you can become a Dental Assistant in less than 10 months! Experience an immersive learning environment with classrooms and laboratory offering the latest dental technology and computer equipment featuring a “real world” operational dental office. Our Dental Assistant theory and clinical curriculum are industry aligned so you can gain the skills needed to be a vital part of the dental team. Be chairside assisting with dental procedures and treatments such as taking impressions and fabricating temporary crowns. Perform dental x-rays and administer the day to day operations of a dental practice such as patient registration and scheduling, patient records, laboratory procedures, inventory control, dental insurance billing and coding, and much more. If you have a desire for helping patients and are seeking a career that will remain in high demand, then becoming a Dental Assistant may be the right fit for you! At National Career College, we understand your time is valuable. We have day and evening classes available to fit your busy schedule!